Can decent email make up for the lack of connectivity? We've seen quite a few budget smartphones recently, with varying degrees of success, including the excellent Palm Pixi Plus, disappointing T-Mobile Pulse Mini and the respectable Nokia C5. This new Qwerty phone from Nokia is designed for tight budgets, though you wouldn't guess this to look at it. It's stylish and smart, though not as slick as Nokia's E72 business phone, for example. The screen has a front that curves at the edges which is neat. The back feels plasticky but overall it has strong build quality; this phone feels good to use. 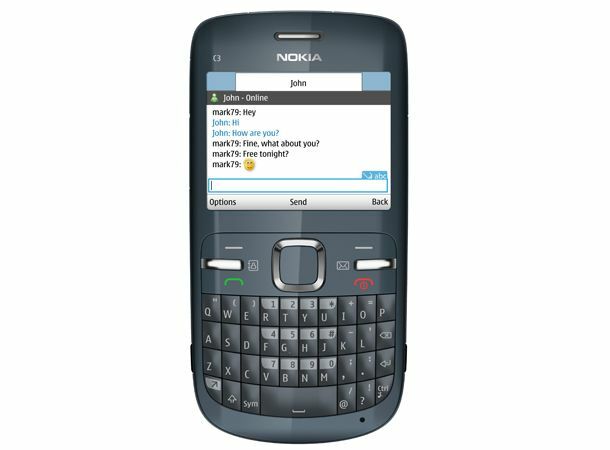 The Nokia C3 does all the things Nokia phones do so well – the 2.4inch screen is clear, the onscreen fonts big, sharp and attractive, the keyboard is easy to use and the direction pad and other buttons work reliably. The keys are particularly well-shaped so it's possible to type fast on it. If there's a fault, it's that the 0 key lies to the right of the 9 instead of in the line below, which takes getting used to. The Symbian Series 40 layout is looking a little tired now, and occasionally it seems to run slow, but it's familiar to millions and highly usable. What it doesn't have is apps in great numbers. The Ovi Store has plenty of options but they're not all available for all phones. No Ovi Maps here, for instance, as there's no GPS in the phone. There are some games and simple programs to be had, but nothing like the range of Android or Apple App Store. A Communities box on the home screen is good for searching Facebook and Twitter updates, limited only by the screen size and its ability to refresh. Corners have been cut to keep the price so low and, apart from the look and feel of the phone, it shows. Nokia doesn't quote the processor speed, but it's certainly not quick, but that may be due to the lack of 3G connectivity. Which means, of course, you won't be able to surf the internet at speed, or quickly download files unless you're in a wireless-enabled area. Wi-Fi is efficient and simple to set up, though annoyingly you have to trawl through menus to switch it on. The camera really isn't great: just 2-megapixel resolution and no flash. The images are okay for picture messaging but not much more. At least there's a dedicated 3.5mm headphone jack – all the phones here have this, but it would have been an easy omission on a handset this affordable. If you want a smartphone with strong email capabilities that's cheaper than a BlackBerry, but you don't want to be constantly surfing at speed, the Nokia is an impressive phone for the price, with a great Qwerty keyboard, though if you want speedy surfing or extras like GPS, you'll need to look elsewhere.